Just purchased the new iPhone X or an amazing Android phone like Samsung Galaxy S9, and want to cast away your old Windows phone to start a new experience? Then you are likely to run into a knotty problem when you are enjoying the journey with your new device — moving contacts from Windows phone to Android or iPhone, which can be quite complicated and time-consuming. But you needn’t worry. Next, this article will guide you to transfer contacts from Windows phone to Android and iPhone without hassles. It is known to all that directly syncing contacts between two phones with difference operating systems is not allowed. So using Outlook and Gmail may be the most convenient way to copy your contacts from Windows phone to Android. Step 1: Transfer your contacts from Windows phone to Outlook. Step 2: Navigate to outlook.com on computer and sign in with your account. 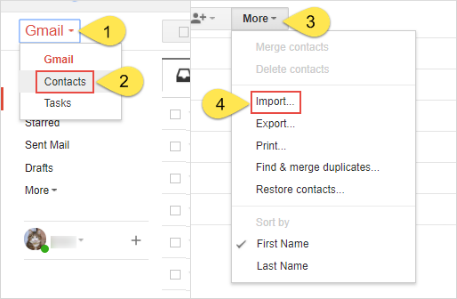 Step 3: Export your contacts as a .CSV file. Tap on the “Menu” button and choose “People” in the drop-down menu. Then click “Manage” in the pop-up window and choose “Export for Outlook and other service”. Step 4: Login to Gmail and click the Gmail icon at top left corner. Then choose “Contacts” in the pull-down menu. Step 5: Hit on the “More” button and select “Import”. Then import the .CSV file by “Choose File” option. Step 6: Add your Gmail account to your Android phone and then you can finally move contacts from Windows phone to android. Tips: For transferring other phone files, you can make use of Microsoft’s OneDrive app which allows you to easily backup documents, photos and videos from Windows phone and then restore them to Android. 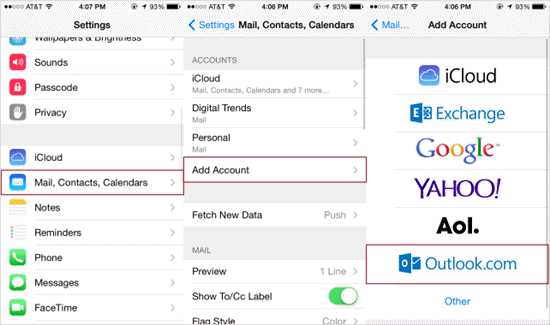 It is much easier to move contacts from Windows phone to iPhone with Outlook because you can directly add Outlook account to iPhone and then sync those contacts from Outlook to your iPhone. Open the “People” app on Windows phone and click “More” > “Settings” > “add an account”. 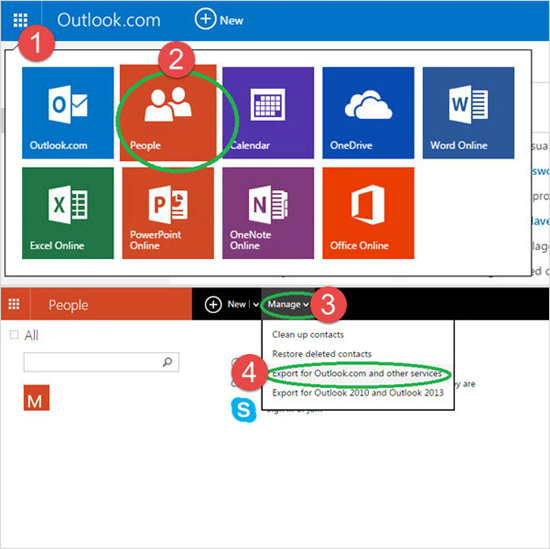 Then sign in with your Outlook account to sync your contacts with it. Go to “Settings” on your iPhone and scroll down to “Mails, Contacts, Calendars”. Choose the “Add Account” option and select “Outlook” in next interface. Login with your Outlook account and password. Then your Windows contacts will be synced with your iPhone via Outlook. Note: In order to copy contacts from Windows phone to iPhone successfully, please make sure the the “Contacts” option in “Account” screen on your iPhone is turned on.